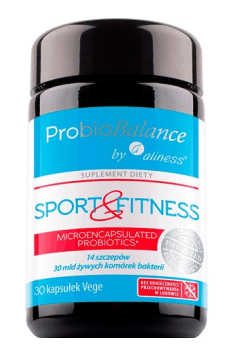 Aliness ProbioBalance, Sport & Fitness Balance is a dietary supplement containing over 30 billion probiotic bacteria in one capsule. In addition, the preparation has been enriched with Fibregum fiber and a buckhorn extract, which support the action of bacteria. This probiotic improves the digestive tract, reduces digestive discomfort and increases immunity. The product is dedicated to people who are physically active, but it will be excellent in all those who want to ensure the proper functioning of their digestive system. The microencapsulation technology used in this supplement consists in coating the bacteria with a double lipid envelope, which allows them to reach the intestines directly, avoiding the destructive effect of the acidic pH of the stomach. As a result, almost 100% of bacteria directly reach the intestines, where they can perform their functions contributing to the improvement and maintenance of the health of the digestive and immune system. Microencapsulated Probiotic Blend is a mixture of 14 strains of over 20 billion probiotic bacteria from the genus Bifidobacterium, Streptococcus and Lactobacillus. These bacteria permanently attach to the bacterial microflora of the intestines and support their activity. They help, among others, to prevent constipation, improve digestion and facilitate bowel movements. Prebiotic - Fibregum ™ Bio LAW polysaccharide is a natural acacia fiber that supports normal intestinal motility, contributing to the reduction of constipation, proper movement of the digestive content, prevention of the formation of intestinal gases and regular bowel movements. This fiber is characterized by low caloricity and very good solubility. It also has a low rate of water activity (below 0.2), as a result of which it does not cause premature activation of bacterial enzymes and delays the initiation of their action until they reach the intestines. Buckhorn extract is a natural plant extract, rich in biologically active substances that promote the health of the digestive system. It also has antibacterial and antiviral effects, thus contributing to fighting infection. It also supports intestinal peristalsis and digestive processes. Probiotic bacteria through their influence on the intestines contribute to the proper functioning of the immune system and prevent infections, especially in sportsmen. They can produce various types of bactericidal compounds e.g., hydrogen peroxide, bacteriocins or organic acids. They also provide greater non-specific immunity – they block the possibility of adhering pathogenic bacteria to the gastrointestinal mucosa and change pH to values that prevent the growth and development of colonies of germs. Bacteria contained in this preparation also have the ability to intensify phagocytosis by the immune cells and increase their activity. They also take part in improving the performance of antibodies, which are crucial for the disposal of bacteria and viruses that attack the system. Frequent complaints in the form of abdominal pain, constipation or diarrhea can be caused by various viral and bacterial infections. ProbioBalance supplies probiotic bacteria, thus helping to prevent and combat these ailments. They may also appear as a result of a disturbance of the normal intestinal microflora after the use of antibiotics. The resulting intestinal sterilization causes digestive problems, which are the cause of food retention in the digestive tract, the formation of gases or diarrhea. Administration of this probiotic also helps to adapt the body to a different diet, resulting, e.g., from changing the menu abroad during an exotic trip or the necessity of introducing new eating habits in sportsmen. Intestinal health has a significant impact on the good condition of the whole organism, because they enable, among others, the absorption of nutrients from food. Frequent malabsorption syndromes may cause deficiencies, e.g. of vitamins or minerals. The probiotic bacteria found in this preparation may contribute to the improvement of the absorption of macronutrients and are also capable of synthesizing, for example, vitamin K or biotin. They also turn helpful in allergies-related problems or intolerances to various nutrients. The constantly increasing intolerances to milk sugar (lactose) occurring in the population are the cause of abdominal pain, diarrhea and constipation. This supplement allows elimination of this problem because the microorganisms contained therein produce an enzyme – beta-galactosidase, which breaks down lactose. In conclusion, Aliness ProbioBalance, Sport & Fitness Balance is a high-quality probiotic that comprehensively supports the functioning of the digestive tract. The product also contains fiber and a buckhorn extract, which further improve intestinal peristalsis. This product also increases the body's immunity, whereas the probiotic bacteria contained in it are particularly conducive to the protection of physically active people.